Vital Elements, who has been hotly tipped by even the godfather Grooverider,continues his impressive run of killer tracks with this Zombie release. Having recently remixed classics such as ‘Junglist’, ‘Hitman’ and ‘Fire’ as part of Serial Killaz and with tracks on Liquid V, Grid and Formation, it seems that this is one producer who is living up to his hype. He touches down for the first time on Zombie with two dancefloor smashers. ‘Rudeboy’ is first up and it nods to the jungle era with old skool atmosphere and sound fx. A massive warping bassline and rudeboy samples build up for the drop. As the drop hits it turns the rave atmosphere from hands in the air, to skanking time, as steppy rolling beats kick off and the bassline rumbles. Definitely one for the rudeboys. 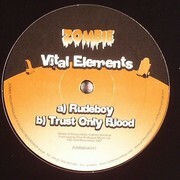 ‘Trust Only Blood’, not for the faint hearted, a real bruiser of a tune, makes up the second part of this release. Vital Elements heavy betas contrast the jungle tinged pads on the intro. Dirty sub stabs start bring the tune to the breakdown, but he calm is short lived, as old skool rave meets with new skool jump up bass to create a monster with a bassline that has more bark than a pit bull. Listen out for Vital Elements remix of Twisted Individuals ‘Custard’ feat MC Biggie doing the rounds in a club near you soon!